It improves your looks and gives you more confidence in communication. It boosts your self-assurance. You will no longer worry that your dentures will fall out from your mouth at an inappropriate moment. It improves comfort and speech. Implants significantly reduce mumbling, lip smacking and poor articulation. It will make eating easier and more enjoyable. You will be able to enjoy any food without worries. It does not damage the adjacent teeth. Implants do not affect the adjacent teeth. It slows down bone loss. Removable dentures often cause unwanted bone loss, which could result in the loosening of healthy teeth. Implants can be used to attach dentures. Dentures may become loose after time and we can address this issue effectively by two to four implants. Solution when multiple teeth are lost. Dental implants can be used to close a gap caused by the loss of teeth. – Exclusive 10-year Elite warranty. – Top quality Astra Tech implants from the market leader. – The quality is supported by many years of scientific studies. – Comprehensive services in one place. Our private dental practice has a dentist who specialises solely in implantology and parodontology. MUDr. Zdeněk Pokorný, PhD. is a recognised expert at home and abroad. He has helped hundreds of patients and he is a guarantee of your satisfaction and beautiful smile. There are several types of implants from different materials. The most common dental implants today include intraosseous implants, made from pure titanium or titanium alloy. 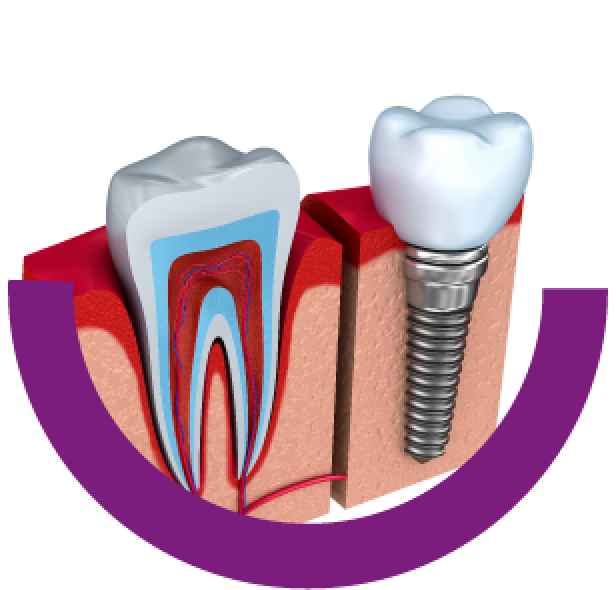 An implant consists of the implant itself and a prosthetic structure (crown). There are many factors determining whether a dental implant is suitable. They need to be examined in advance. If necessary, a patient will be prepared for the procedure. If rules are followed, the implant success rate is 95%. The implant heals 8 to 12 weeks in the bone and then a prosthetic suprastructure (crown) is prepared. After the crown has been made and glued, the patient is invited for regular check-ups and hygiene, which is very important for implants. If an implant is unsuitable, we will offer a patient a different option of replacing the missing tooth or teeth. Our centre has a specialist in dentures, crowns, bridges and tooth modelling using the CEREC software.